Tagines or tajines are wonderfully aromatic North African stews that combine meats, poultry, chicken, or fish with fruits, vegetables and a large variety of spices. The centerpiece of Moroccan meals, there are literally hundreds of traditional tagines as well as many regional variations. 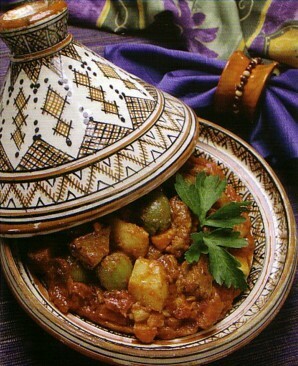 Tagine refers to both the stew and also the specific clay pot in which they are cooked. Just thinking about tagines takes me back to the first one I was served in a small village in southern Morocco years ago. At the time, my husband and I were traveling to Tafarout to attend a festival celebrating the flowering of the almond trees. We befriended a couple of young Moroccan men who invited us to attend a traditional Berber wedding in their village. The night before the ceremony, we went to the groom’s house for dinner and, upon arrival, were escorted into the living room, which was a long narrow room with deep benches covered with pillows and colorful oriental carpets on the floor. There were about 30 men wearing hooded djellabas (robes/caftans) lounging on the benches, with not a woman in sight! The sexes were separated but since I was a Western woman and they didn’t know what to do with me, I was allowed to stay. The men had already eaten, so only the four of us were invited to sit on the floor around a large ornate brass table in the middle of the room. And with totally silent strangers watching our every move, we went through the ceremony of washing our hands. Since everyone eats from communal bowls or platters and no utensils are used, this ritual always begins a meal. A large basin with a silver kettle full of water, a bar of soap, and a towel were brought in by a small boy, and while the basin was held under our outstretched hands, the water was poured over our hands and we washed, rinsed and then dried them. We were now ready to eat. Veiled women entered the room and placed a large tagine on the table along with a loaf of flat Arabic bread. When they lifted the lid off the tagine, the aroma of the spiced stew filled the air. Thankfully we remembered that when eating from a communal plate in the Arab world, you never, never use your left hand as it’s considered unclean. We tore off pieces of bread and, using it as you would a fork or spoon, scooped up the stew. One taste and I quickly forgot that all the eyes that were on us, and lost myself in the wonderful flavors of the tagine. I didn’t even realize that after a period of time, conversations had been resumed and we were no longer the focus of attention. Upon finishing our meal, the hand washing ritual was repeated. Afterwards, the groom sprinkled our faces and hands with orange blossom cologne from a long silver flask. How civilized! We were then served glasses of “Berber whisky,” Morocco’s famous mint tea. Located on the western corner of North Africa, Morocco and Moroccan cooking reflect a long history of interaction with a number of cultures–French, Spanish, Jewish, Arab, and British to name a few. And although the population is largely indigenous Berber and part Arab, their foods are unlike those of any other Middle Eastern country. In fact there is no other Arab country that can boast about such a rich and varied cuisine. The Phoenicians were the first to arrive in Morocco when they were establishing trading routes around 1,000 BC. Then came the Romans, who ruled for three centuries and, in the seventh century Morocco became part of the Byzantine Empire. Arabs established Morocco as a major port-of-call and introduced many spices such as cinnamon and ginger as well as the Persian love of adding fruit and honey to meat dishes. From the Andalusia region of Spain, which was also influenced by Arabic Moors, came the culinary technique of combing sweet flavors with spicy tastes in one dish. And, after the discovery of the New World, chiles made their way into the area via the Iberian Peninsula. Jews fleeing the Inquisition introduced potatoes, tomatoes, and olive oil to Moroccan cooking. And the spice caravans coming from the south through the Sahara brought exotic foods and seasonings from other parts of Africa. According to Copeland Marks, noted expert on some of the world’s spiciest cuisines, “No other county with the exception of India, uses a greater variety of spices than the Moroccans.” Both countries have many spices in common which suggests that the same spice merchants had an impact on both countries. Moroccan food, however, is not as fiery as Indian cuisine. Tagines are relatively easy to assemble but they do require a long cooking time. This slow steady cooking gently reduces the sauce to produce a smooth texture and blends the spices so that they don’t overpower the dish. Another advantage of this long simmering is that less-expensive cuts of meat are made tender by this method of cooking. 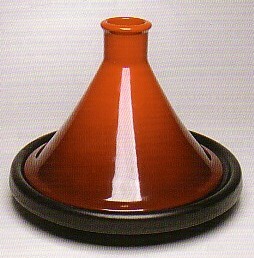 The traditional cookware in which the tagines are prepared are also called tagines. Made from clay, they have shallow, round bases with conical lids. Traditional tagines can range in size from individual servings to ones that are large enough to serve 20 people. The shape of the tagine allows the moisture and heat to circulate in the pot and allow the stew to simmer over a long period without having to add additional liquid or even to pay much attention to the dish. There are two kinds of clay tajines that are used in Morocco. One that is made of brown earthenware that has been partially glazed is used for cooking and the beautifully decorated ones are used for service only. The decorated ones can be used for cooking but heat over time will blacken them. Both these styles are available in some speciality cooking stores and on the Internet. Le Creuset, whose cookware I’ve used for years, introduced a updated tagine a few years ago. This tagine has a cast-iron enameled coated base with a stoneware top. The lid has a tighter fit than a clay tagine so that there is really no need to open and fuss with the stew. The feature that I like best is that with a cast-iron base, you can saute right in the tagine. Although many of the traditional stews do not call for an initial browning, I think that sauteeing some ingredients adds to the richness of the finished product. And finally, getting back to the tale of my first tagine, I guess we passed the test with that group of Berber men. After that tension-filled first dinner, we became a part of their community. Everyone greeted us as friends, invited us to meals in private homes, and to attend ceremonies and celebrations. They even offered us a house to stay in while we were there! We became such a part of their village that some of the young girls even dropped their veils so both my husband and I could see their henna-enhanced beautiful faces. Since then, I’ve collected many recipes and enjoyed many tagines, some of which I’m sharing with you. Some of these recipes appear in Dave DeWitt’s and my book, The Spicy Food Lover’s Bible. This is my take on one of the most well known tagine of chicken, lemons, and olives. Preserved lemons are traditionally used in this recipe, but since most cooks don’t stock these delicacies, lemon juice and lemon zest have been substituted. Couscous is, however, readily available, so I recommend serving this stew over it for an authentic taste. This exotic and complex Moroccan spice blend is prepared with 20 to 30–and sometimes up to 50–different ingredients that range from the common to the downright strange. A typical spice merchant can carry up to 200 different spices and herbs, so it’s no wonder that there is a mind-boggling number of variations of ras el hanout, which means “head of the shop,” and refers to the special blend of the shopkeeper. Traditionally, the blends contain dried flowers and also an aphrodisiac such as Spanish fly, monk’s pepper, or ash berries. We’ve included a flower, but not the aphrodisiac. This mixture is best made fresh and is used to flavor tagines, couscous, lamb, and game dishes. Heat a heavy skillet over high heat, add the caraway, cumin, cardamom, cinnamon, allspice, and cloves and dry-roast until the seeds darken and become fragrant, being careful that they don’t burn. Allow the mixture to cool completely. Place the toasted mixture in a spice mill or coffee grinder along with the lavender, and process to a fine powder. Sift the mixture if you want a fine blend. Combine the toasted mix with the remaining ground spices and stir to blend. Store in an airtight container in a cool, dark, dry place for up to 4 months. This recipe from Le Creuset demonstrates how simple it is to prepare a tagine. The conical shape of the lid allows the steam that is produced by cooking to re-condenses as it hits the cool sides of the lid and, instead of evaporating, flows back down to the food keeping it moist. Heat the remaining oil in the bottom of the tagine or skillet and fry the shallots, potaotes, and carrots until they begin to color. Remove. Serve this tagine with plain couscous. 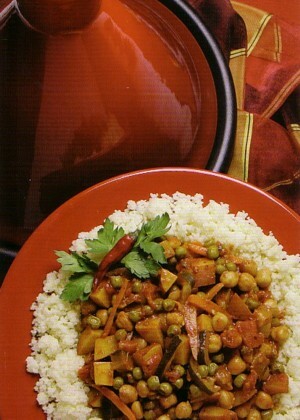 This vegetable tagine is a very popular dish that is served throughout Morocco. It is traditionally served on Fridays and special holidays, such as the Berber wedding I attended. The recipe has a long list of ingredients, but it’s easy to prepare and can be made ahead of time. Like most stews, it tastes even better on the second day. Heat a Dutch oven or stockpot over high heat and add the oil; when hot, reduce the heat, add the onion and garlic and saute until soft. Add the harissa, chiles, cumin, ginger, cinnamon, and allspice and continue to cook for 5 minutes. Add the broth, saffron, and potato and bring to a boil. Reduce the heat, cover, and simmer the stew for an hour, adding water if necessary to thin if it becomes too thick. Add the tomatoes, carrots, and chickpeas and simmer for 20 minutes. Add the zucchini, eggplant, and peas, and simmer until the vegetables are done. Taste and adjust the seasonings. Put the couscous in a bowl and add an equal amount of boiling water; cover and let stand for 5 minutes. Stir the lemon juice into the stew, taste and adjust the seasonings. To serve: mound the couscous on a platter, top with the stew and garnish with the parsley. Serve with additional harissa sauce on the side. This fiery chile paste originated in Tunisia, where it is the most important condiment used in cooking. Its popularity has spread all over North Africa, from Libya to Algeria and Morocco, and even in Sicily. Harissa is derived from the Arabic word for “to break into pieces” referring to the traditional method of preparation, which involves pounding peppers into a coarse paste. Modern methods using a blender of food processor produce a more saucelike harissa. There are many variations on this condiment, and although it’s available commercially, it’s easy to prepare and will keep for many weeks in the refrigerator, so why not prepare it fresh? It’s commonly served with couscous, vegetable and meat tagines, and grilled foods, and is also used to flavor soup and egg dishes. Place the chiles in a bowl and cover them with very hot water. Allow the chiles to steep for 15 to 20 minutes to soften. Drain the chiles and discard the water. Place all the ingredients, except the oil, in a blender or food processor and puree until smooth. With the motor running, add the oil in a steady stream to form a thick sauce. This sauce may be stored, covered, in the refrigerator for up to 3 weeks. Be sure to cover the top with a couple of drops of olive oil to prevent the harissa from turning brown. Charmoula has been referred to as an all-purpose spicy cilantro pesto. It’s almost always served with fish, but it can also accent chicken dishes and steamed vegetables. Here it’s used to marinate the fish before cooking and also to season the tagine while it’s simmering. The celery is used to keep the fish off the bottom of the tagine so that it doesn’t stick to the bottom and allows the sauce to stay under the fish and provide moisture. If you don’t have celery, you can use carrot sticks or bamboo skewers broken in pieces. Like most tagines, it’s usually served over couscous and makes a complete meal. Place all the ingredients for the Charamoula, except the vinegar and oil, in a blender or food processor and pulse to coarsely chop. With the motor running, slowly add the vinegar and enough of the oil to make a thick paste. Allow the sauce to sit for 20 to 30 minutes to blend the flavors. Place the fish in a non-reactive dish, cover with the Charamoula, and marinate in the refrigerator, covered for two hours, turning occasionally. Heat a heavy skillet, add the oil and saute the onion until just soft. In the bottom of a tagine, Dutch oven, or heavy casserole layer the celery in a cris-cross pattern. Add the carrots, tomatoes and one half of the onions, and season with the lemon juice and half the pepper, cumin, salt and pepper. Drain the fish, reserving the marinade. Place the fish on the vegetables and add the remaining onion, and top with the lemon wedges. Season with the remaining red chile, cumin, and salt and pepper. Add the olives and arrange the bell pepper over the top. Mix the reserved marinade with 1 cup water and pour over the tagine. Cover the dish and bake for 40 minutes. Increase the temperature to 400 degrees F. and bake until the fish flakes easily and the vegetables are tender. Garnish with the chopped cilantro and serve with couscous or rice. This recipe is a recreation of one we enjoyed in a small restaurant in the south of Morocco. There are a number of variations of this tagine, which is traditionally made at the celebration of Aid el Kebir or the Feast of the Slaughter of the Lamb. This recipe reflects the Persian influence of combing fruits and meat and the ease of which tagines can be prepared. No browning is called for, just place all the ingredients in the tagine and walk away. I’ve added some heat to the dish and, if you don’t care for lamb, substitute beef. In a tagine, large stockpot, or Dutch oven, whisk the ras el hanout, ginger, cayenne, saffron, salt and pepper into half of the broth. Add the lamb, onion, garlic, cinnamon stick, tomatoes, and butter. Add the remaining broth and place over a high heat. When the liquid is almost boiling, reduce the heat, cover, and simmer until the lamb is tender about 1 1/2 hours. Stir in the prunes, almonds, honey, and cinnamon. Cover and simmer until the meat is very tender, an additional 30 minutes. Uncover the pot, raise the heat and cook over a medium high heat, and stirring occasionally, until the stew has slightly thick, about 20 more minutes.